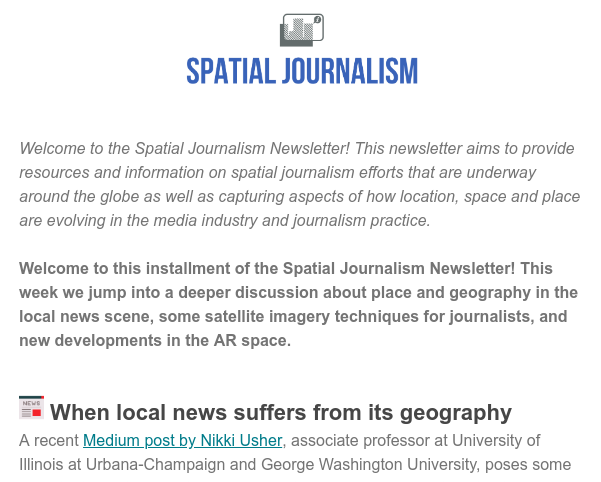 Last week’s Spatial Journalism Newsletter by Amy Schmitz Weiss of the San Diego State University featured a trove of new developments in digital journalism. She highlighted a Medium post on the place-based consequences media is faced with today written by Nikki Usher of the University of Illinois at Urbana-Champaign, IJEC’s home base. You can subscribe to the newsletter on Amy’s website www.spatialjournalism.com. Usher explains how news organizations at the national and regional level have taken on different scale strategies for their sustainability but in the process, how these approaches have hurt them along the way and the audiences they aim to keep. At the same time, non-news entities like Facebook and Google have also created different economic challenges for the news industry and dynamics that have shaped in some ways, unknowingly what journalism has come to represent today. Nowadays, satellite imagery can be accessed by anyone and can provide some key insights to places anywhere in the world. For journalists, satellite imagery can be used as a fact-checking and verification tool, a news gathering tool for an investigative news story or help with showing historical change over time in a specific area. Mark Doman of ABC News talks with Jacob Granger of Journalism.co.uk about the possibilities and challenges of using satellite imagery for news gathering and reporting. Doman gives some good tips on places where one can access satellite imagery and techniques on how to make sense of the imagery captured for reporting purposes. You can also follow Amy on Twitter, along with IJEC.